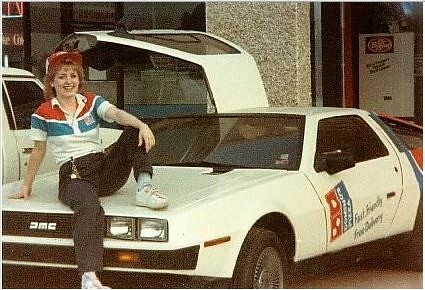 Confirmed to have been the "Domino's Pizza Delorean." Period pictures exist of the car in its pizza-livery glory. James Espey reported this car at DMCH on 4/29/2017, still red white and blue but no Domino's sticker. Rich W. reported that he had looked at the car in Kokomo, IN. in 2002. After that, the car made an appearance on ebay. Summer 2016: Back on Ebay! It has been a week since the previous auction ended with a high bid of $18,300, which did not meet my reserve. So, I'm going to start this auction at my prior reserve which was $19,000 which means, if you are the only bidder, you will own the car and all the parts. Second, Just to be clear, I will not ship this car or the parts. If you are the winning bidder, you will have to make arrangements to have it picked up here in Arkansas. Ok folks, this is the auction that several dozen people have been waiting for. 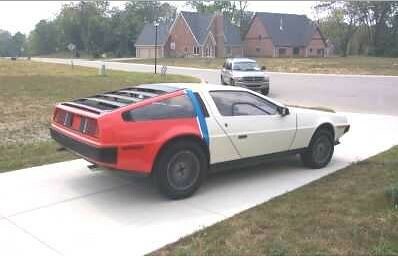 Since I did not sell all my cars in one big lot, I am breaking out the Delorean for a single auction. For all the guys that called me or sent me emails, this is your chance to bid, not only on the car, but a bundle of spare parts that go with it. More on the spares later in this writeup. First, a little history-this car was bought off the showroom floor by the owner of Domino’s Pizza (Tom Manoghan) in 1981. It went directly to a paint shop where it was painted in the Domino’s colors. From there it was used to deliver several pizzas so PR pictures could be taken. After the picture taking was done, the car was put in the owner’s private museum for many years. The owner went bankrupt in the early 90’s, so the car collection was auctioned off. A gentleman bought it at a court appointed auction in 1992 and put slightly over 7300 miles on it before he decided to trade it in. I bought it from that dealer in 2002 and have had it ever since. I put very little mileage on the car, so hence, the total mileage today of 8203. Of note, the opening picture for this ad was taken in 1981 as part of the PR campaign. And before you ask, there are no dents in the hood from the young lady sitting on it. Note: the gas cap flap is missing in the picture but it was replaced with an original SS (unpainted) one in 1981. It is the only exposed part of the body that is unpainted. Okay, now to the car-it is a 6 cylinder, automatic with a black leather interior. Everything on the car is in working order. The lights all work, car starts right up every time, automatic transmission shifts smoothly, brakes have just been rebuilt with a new master cylinder, and the A/C blows cool, but not cold (it needs a charge of R12 or switched over to the R135). It has the new John Hervey fuel system installed, no eyebrow present, dark gray wheels, original antenna in the windshield, original console clock (yes, it works), workshop manual, parts manual, dash board cover, and full car cover. Now, I would be lying if I said there were no problems, so here’s my ‘fix later’ list which I will leave up to the new owner-the glove box lock is missing, the fuse block should be replaced with a new John Hervey one, the paint is 35 years old and has some chips (some of which I show in the pictures, previous owner did not do a good touch-up job), the engine needs to have the dwell set, outside mirrors are fogging, and the tires are old (less than a 1000 miles on them, but I wouldn’t trust them at any speed over 30 MPH. Items that are not original—-radio knobs, cigar lighter, dual maintenance lights in the engine compartment, and a hidden battery cutoff switch. Now, before you bid, ask your wife if it’s ok to bid or check with your banker for a loan. Just make sure you have the funds available—-$1900 PayPal deposit within 24 hours and the remaining amount within the 10 day window. If you are the winning bidder, I expect you to follow through with the transaction. All of you already know the eBay penalty rules. Now, on to added bonuses—-a sample of the spare parts that go with the car: a complete engine (condition unknown), mixture control, rear closing panels, fuel tank, brake master cylinders, new brake pads, wiring harness for entire car (minus what I used), complete set of silver wheels, a T-top, fuel injectors, rear closing panels, and a whole bunch of small items. Look at the pictures and you will see many boxes on the floor. They are filled with spare parts, some used, some brand new. It all goes with the car!!!!!!!!! Lastly, if you are the winning bidder, please don’t show up and plan on driving this car to its new home. Did I mention the tires are really OLD? You will need a minimum of a flatbed trailer for the car and a pickup truck for all the spare parts, and even then, you might not get it all in. If you want to see the car run, I will be glad to fire it up and run it up and down my concrete driveway, but I will not take it out to the main highway. I live 1.6 miles down a county dirt and gravel road and it rates a 2 on a scale of 10. I don’t even drive my MGs on it any more. So, now you know the who, what, where, why, and how——if you have any questions, please feel free to send them through the eBay question and answer forum. I’ll be down in Texas for a couple days so it may take me a little time to get back with an answer. Thanks for looking and good luck to all bidders.